Complete and interact with the tile-based contraption to light up all lightbulbs in each level. As my first game to actually be released on some market, I decided to start small so that I won't run into the infamous "unfinished forever" wall. I decided to release an experimental version first and see where that goes, since I actually don't know how well the average app does. I tried looking for the "literally newest" releases on the Play Store, but unfortunately I only found "top new apps". So I imagine that maybe there is a whole load of apps (like "the 99%") that don't get any chance for any visibility, and I admit I didn't want to invest too much time on something that might end up like that. Can you please make a desktop version? My android phone is under repair. Thanks for the reply. I uploaded the link on the first post. I've extracted the JAR file onto my desktop and ran it. The window and the ui shows. But there is nothing when I click the level. Aw jeez, I made a stupid error. I hard coded the absolute path in the level-loading code for desktop. Fixed it, should be ok now (updated link). Thanks for the notification. Hey, played it and I liked it a lot! It works really well, however, there are (not important) little bugs, doesnt affect the gameplay, but with level 19 you get lots of pistons and there I get weird results sometimes, just play with it... Also, more important is the screen bug, if I want t play this fullscreen I get very big icons, I only see 4 of them, and with smallscreen I get also very weird results... Just scale it. Think I fixed the resizing bug (updated link). However, I thought I fixed a specific piston bug you mentioned (damn level 19 especially), but I guess not. Did you keep getting more pistons the more you dragged? Thanks for the feedback! Very encouraging. Aha, nicely done. Very much enjoyed it! I do have some constructive advice (Friendly advice of course). I didn't read it anywhere else, but I was a little confused at the start, I couldn't get the hang of it at first, maybe a tutorial or something? I think it be mighty helpful! Well done though, looking forward to what else comes from you. I didn't really have any instructions so the player can discover stuff themselves. But I do believe that there is a point where a game can be so uninformative that it's not fun anymore, so yeah, I might add a tutorial thing. If you try to take back a switch (lever), it will just toggle its state. Lol, this is the best way to learn redstone! Go sell your game to notch! How many people (kids) don't understand redstone? Try this 1982 title. Kids these days think minecraft invented everything. What a great puzzle game. I like it! Updated the game with 20 more levels (so now 50 total) and some more elements. Also added some glow effects which turned out nicely. Updated links. Since I made the levels, I don't have a good idea on how difficult they are lol. I'm also afraid that players won't understand what new elements do, although there are "introduction levels" for almost each element--without words--kind of like how 1-1 was designed for Mario. I'm also afraid that there might be levels where there's a super-shortcut for seemingly complex ones, although that can be considered "cool" since players can find ways which wasn't intended by the creator to be found. I should add some kind of social aspect to the game to help it spread, since that's kind of a problem right now. 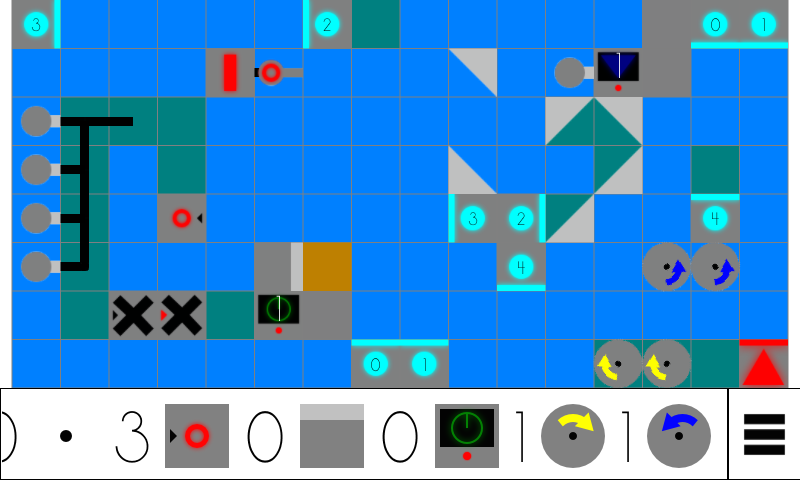 I was thinking of having a player-accessible editor where they can create their own levels and send them to other people or to a central server. Unfortunately network stuff isn't my forte (especially on Android) so I guess I should familiarize myself on that. I love it. Screw texting, puzzle games are what mobiles were made for - and your's has LAZERS. -Your UI is a bit disconcerting at first. You press a button and nothing happens, then the menu starts to fade away. I thought my phone was slowly dying at first. A little feedback would be nice - make them go black for a second on press to simulate the depressed state most GUIs have perhaps. Otherwise I love its minimalist nature. -The game is quite quiet, deathly so in fact. Ultimately I would love for it to have a little background music but for now you could do some simple sound effects. Switches turning on. A lazer power up/ power down sound. Lazer hitting mirror sound. You could also make a sound for pressing a menu button to help with above. I just finished with the "UI responses" (buttons get highlighted when hovered (on PC) or touched); I'm gonna implement sound soon. Major change is the addition of the editor; basically a sandbox. In the future, I hope I'll be adding an ability to upload the custom-made maps to a server or to others for them to play and an ability to resize the maps for greater possibilities. Almost done with basic sound. Just installed your latest update. The game works but I get a crash when pressing the back button from the levels menu. I could get the log for you if you'd like but it would be something of a hassle (finding/installing drivers etc.) It's an HTC Wildfire S running Android 2.3.3. Also I think the back button exiting the game on any non-main menu screen is probably undesired behavior? Certainly annoyed me. Do you mean the back button on the Android phone itself? Oh, and, if you stumble on level where it might be impossible to clear, please tell me. I did playtest them, but I might have missed some things for some reason. Yes on the hardware back button (at least its hardware on this phone). But yes the not-the-button-you-drew-in-software back button. This is straight from running adb in the command prompt and I had to sift through a lot of stuff since I didn't know what your apps package name was. So I might have missed something but I don't think I did. Oh, I actually hadn't implemented Android back button functions. I actually don't really own an Android so I wasn't familiar with that... Anyway, I now implemented them (well at least for now it goes back to the menu screen from the levels or notes screen). I might have it open up the menu dialog in puzzle or editor mode, if that's an appropriate function for the button. Also, I think I fixed the crash (now checks if these certain variables were initialized). Unfortunately now there's ads for cross-promotion. In Android apps, the default behavior for the back button is to exit the app. Yes, I think opening up the menu would be best. Essentially, since you are doing it for desktop you can't have any android specific button doing something you cannot do in the desktop if that makes sense. A little cross platform design philosophy for you there. As for adds, you do what you have to do.